As the patriarch or matriarch of your family business, you are probably already managing other family members from Generation X (born between 1963 and 1980) and Generation Y (born after 1980). The differences between our generation and the new generations must be considered in current family business management and next generation planning. Key topics for the next generation are work-life balance, flexible work hours and corporate mission. As a proud, card carrying member of the Baby Boomer generation your game plan was work first and foremost, climb the corporate ladder and retire with a healthy pension plan. The game has changed. Today’s players are creating a paradigm shift in family business management and environment based on their priorities. I work with many family businesses in many market spaces, industries and geographic locations. The playing field has changed and many family business managers may be unaware of the focus. Certain game plans exist today that are universally consistent when managing Gen X and Gen Y family members. This is probably the most profound shift in values for Gen X, and even more so Gen Y. Work-life balance is a prominent goal and they may focus on a position’s time requirements. This isn’t to say the younger generations are not hard workers. On the contrary, they put tremendous effort into their work, but they also place a high value on their personal time away from the family business. This balance can be even more difficult to obtain in the family business than in the corporate world. Next gens seek to grow their skill set without having to sacrifice every other area of their life. As a family business manager, it is imperative to understand this desired balance. Most people are familiar with the term “career path.” The Baby Boomer generation in family business experienced preordained opportunities to enter the family business and ascend, or even begin in, leadership positions. As family business managers see the benefits of next gens working outside the family business, the younger generations sometimes do not have such consistent opportunities. More importantly, many of the next generation do not subscribe to the same loyalty as the Baby Boomers. Gen X and Y family members are looking for a “skills path.” They desire to understand what skills are needed to be successful in the position today. The long-term incentive is to understand what skills they will personally develop or acquire within the family business. They prefer a horizontal management structure and respond to personal skill development. Titles are out. Responsibilities are in. It is imperative to share with the next gens the responsibilities they will inherit as their skills become more advanced during their time in the family business. As mentioned, the younger generations have a fairly horizontal view of the org chart – whether accurate or not. 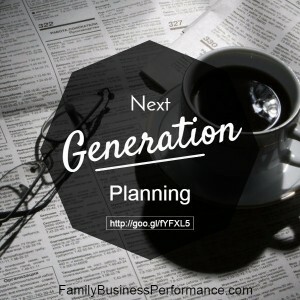 This approach can wreak havoc in a family business dominated by Baby Boomers. The Baby Boomers expect an almost military-style chain of command while the younger generations have a more fluid approach to positions of authority. Gen X and Y highly value the manager-employee relationship. This may be even more applicable when that relationship is parent-child as well. Next gens view their manager as guide – an experienced Sherpa to make sure they are on the right path. See the connection with a parent-child relationship? It can be difficult to separate the two in family business. Next gens are plugged-in to technology from iPhones to Apple Watches. They have spent much of their working careers, even entire lives for some, having Internet information available to them at a moment’s notice. This technological ability can be a great benefit to the family business. Gen X and Y family members have developed strategic thinking. Their youthful age belies the fact that they have sharp minds for understanding macro markets. The Gen X workforce will be ascending into prominent management positions in the family business at a brisk pace. Progressive family business leaders should perceive these current shifts and adjust their next generation planning accordingly.